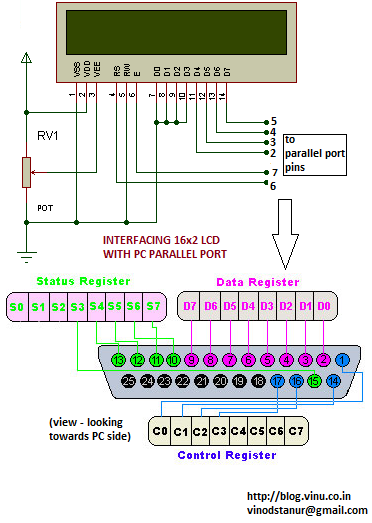 This is a small parallel port char driver for printing text on a 16x2 lcd module connected at parallel port of a PC. I did this as a part of learning linux kernel-module programming. May be this could be considered as a hello world device driver. 4>Setup the 16x2 lcd as in circuit diagram and power on the 5v supply to lcd. 5>Insert the module using "sudo insmod lcd.ko"
6>Now if every thing is all right, then we could see a text "DRIVER INSERTED" on the second row of 16x2 lcd. 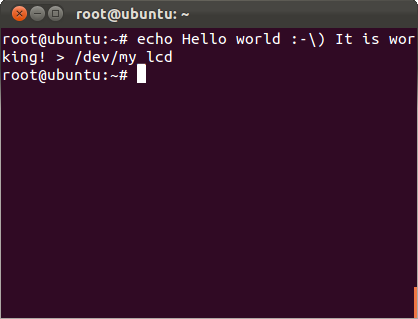 7>Now create a node any where, with major number 61.
eg: "sudo mknod /dev/my_lcd c 61 0"
Type "echo HELLO WORLD > /dev/my_lcd" . 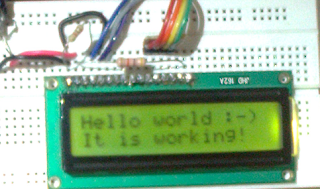 This should print HELLO WORLD on the lcd. type "date > /dev/my_lcd" and observe the date on lcd. Type "echo THIS IS A LARGE STRING CONTAINING MORE THAN 32 CHARACTERS. 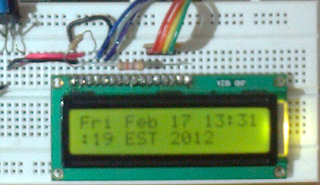 I WANT TO SEE HOW IT IS DISPLAYED ON THE LCD > /dev/my_lcd" and see the long string on the lcd. Type "ls > /dev/my_lcd" as root and observe contents on the folder on the lcd. How about USB driver? It would be more fun. Good job. I have learnt a lot with this tutorial. Well done !! No pude lograr la compilación con make. 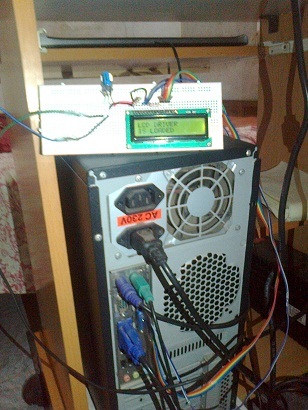 I try it with pic16f877a, and i used usb serial port in my laptop. very much helpful to beginners like me..
can any one help me regarding circuit diagram of this.I have made it but data is not coming on LCD. Makefile:614: *** missing separator. Stop.